Mealtime has been a huge challenge for me. I grew up in a home where we would eat out often and though we had meals as a family we didn't always make it a priority to spend time in the kitchen together. We had dinner at a friend's house just before Christmas and we made homemade pizza. Rowan looked at me and Andy and asked why we never did this at home. He kept saying how much he loved it and continued to ask my friend Sara if he could help in the kitchen. It broke my heart. If I ever felt like a failure as a mom, that was definitely then. I really haven't made a point to be together in the kitchen, it really made me realize how important that time is! When we got home the next few nights Rowan asked to help set the table - you would have thought it was Christmas! He was beaming as he got the plates down and assigned them to everyone. I knew right then that things would have to change. I wanted them to change! So it was my goal to make being together and finding ways to do things in the kitchen, as a family, priority! This was a part of my children's childhood that I wanted to be sure to create more memories in and try to hold on tight to these moments to bond. To help start this progress I knew it would be important to have Wrennyn be part. 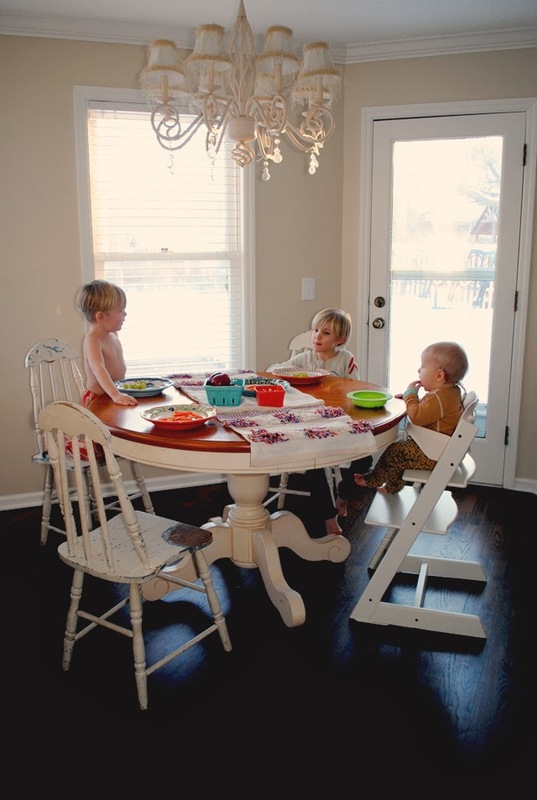 The boys always felt bad for him off to the side in his high chair - they would pull him over next to them at the table and try to reach him. I knew it would mean a lot to us all to have him be at the table alongside us and be part of each meal. 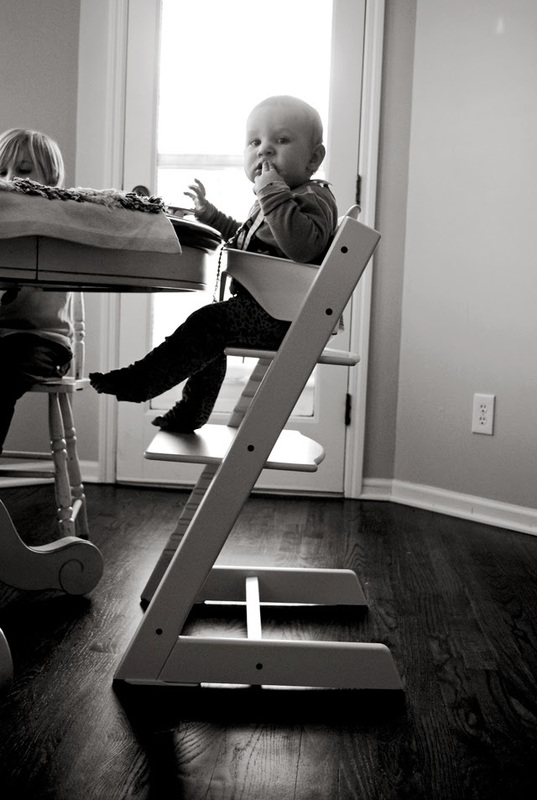 So we were thrilled when our Tripp Trapp arrived from Stokke! I can't even tell you how cool Wrennyn thinks he is in his new chair sitting next to his brothers! It is hilarious! He squeals and jumps to go in it! 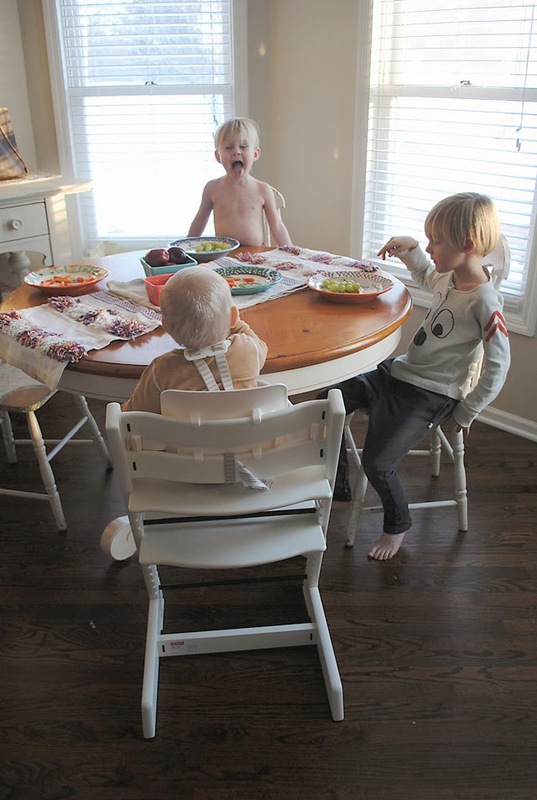 The boys think he is so funny sitting at the "big boy table" now and have already taken it upon themselves to fight over who gets to sit next to him! Rowan was so anxious to get Wrennyn at the table with us that he asked to help put the new chair together. The brilliant Scandinavian design made it incredibly quick and easy to assemble it! Rowan actually did more assembling than I did! But mostly we were al thankful to have the presence of Wrennyn being at the table with us. There is such a big part of the experience and him being right in there with his big brothers that makes me wonder why I didn't think of this sooner! Why did we have him so far off from us at meals? Why didn't I work harder to get the boys more involved at dinner? Why do I hate cooking? Well, I don't really know the answer to these - I only know that it is my goal to make this a bigger priority for our family. I hate cooking but I am working hard to make it more meaningful. My husband told me to get ready, boys eat a lot and are always snacking. 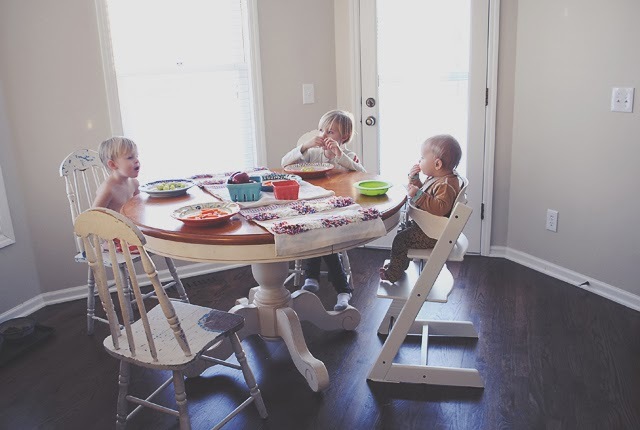 Well, I am not sure how I will be able to keep up, but I new realize how much I will grow to love spending more time in the kitchen and what a strong bond mealtime really creates! 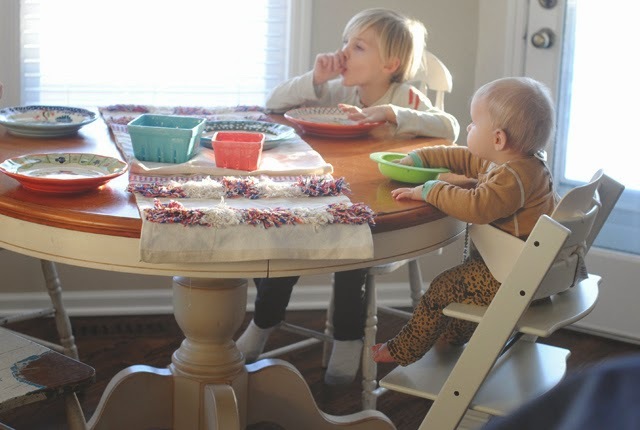 Wish I had known about the Stokke Tripp Trapp a lot sooner and made it this easy for my older boys to be part of meals at a younger age! I am starting to see how valuable these relationships are when you build these daily bonding opportunities! 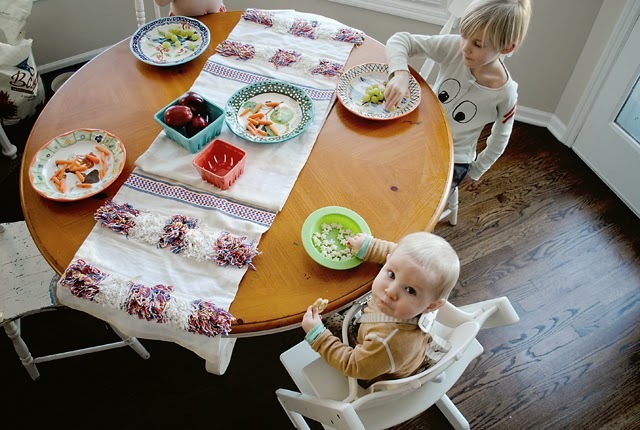 And a HUGE thank you to Stokke for making a product that not only looks good at my table, but is much smaller than a high chair and makes it easy for him to join our family at the table. 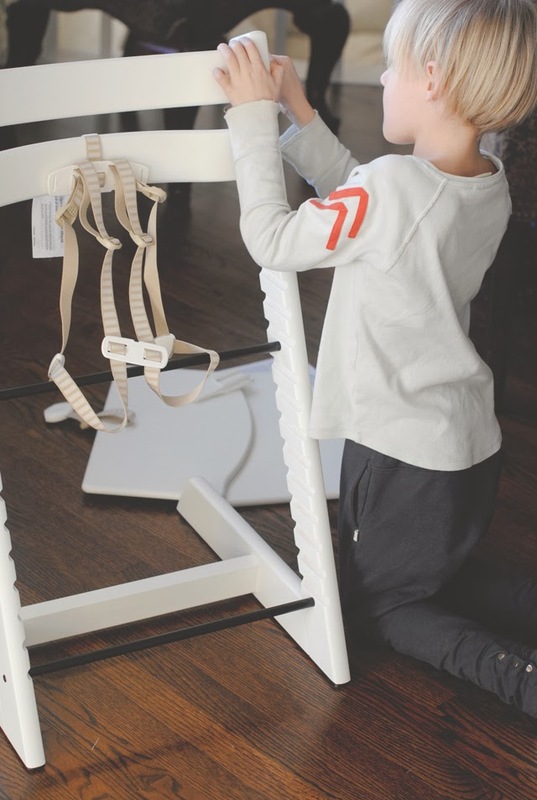 couldn't help but share this photo of Rowan thoughtfully helping me assemble the Tripp Trapp. love the tripp trapp!! !love that you recognized what your family needed and are filling that void. your babies are blessed to have you as their mama. thanks so much for sharing and inspiring all the other mamas out there, myself included.